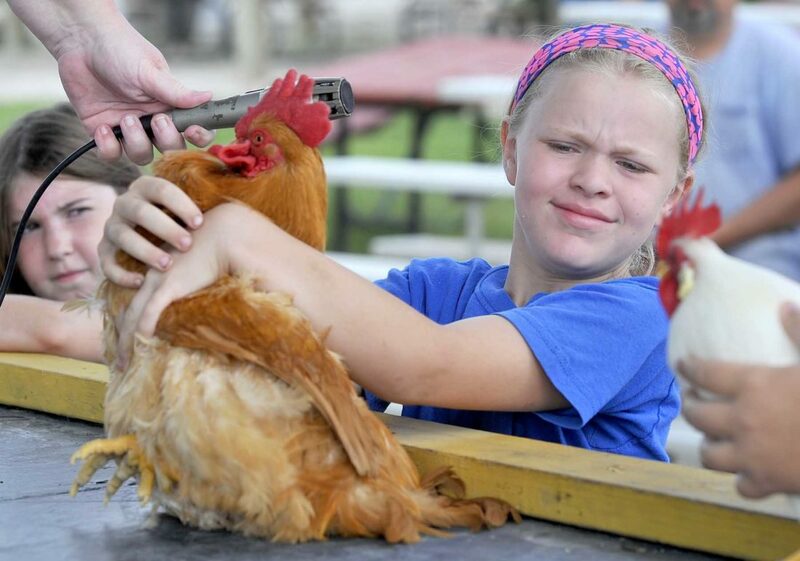 -Messenger photo by Hans Madsen Leah Mills, 8, of Harcourt, a Clover Bud, has a slight difference of opinion with Pickles, her entry in the Rooster Crowing Contest at the Webster County Fair Sunday morning. 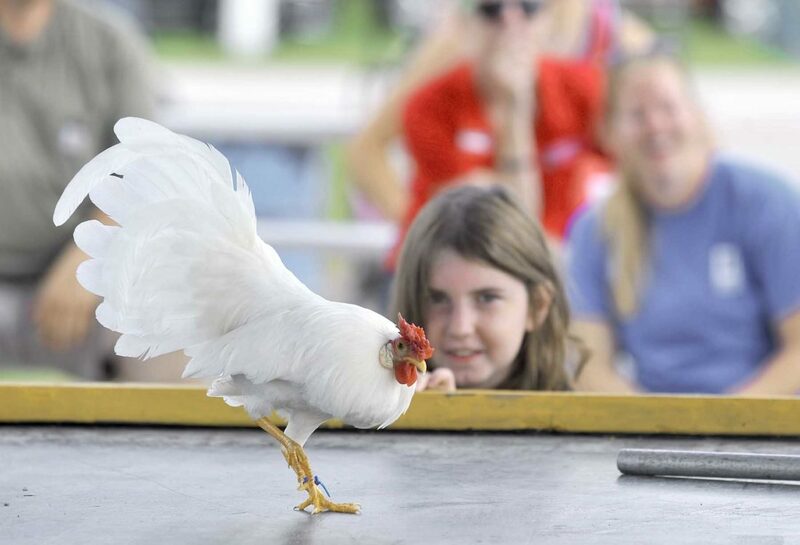 -Messenger photo by Hans Madsen Leah Mills, 8, of Harcourt, a Clover Bud, watches as Pickles, her entry in the Rooster Crowing Contest at the Webster County Fair, rejects the offered microphone and opts to crow without amplification Sunday morning. -Messenger photo by Hans Madsen Morgan Christensen, 9, a Clover Bud, watches as her borrowed rooster Jeffrey tries to decide whether or not to crow Sunday morning during the Rooster Crowing Contest at the Webster County Fair. 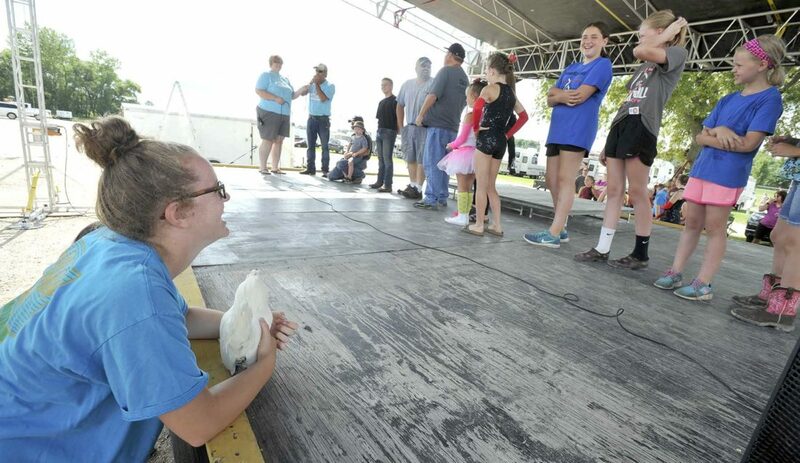 -Messenger photo by Hans Madsen Shelby Mills, 14, of Harcourt, a member of the Badger Builders 4-H Club, watches the human division of the Rooster Crowing Contest with her avian entry, Maximus the rooster. -Messenger photo by Hans Madsen Exhausted by his efforts during the Rooster Crowing Contest, Pickles closes his eyes for few seconds to gather his thoughts and contemplate his future on stage. Contest winner Charlie, at right, accepts his accolades from the crowd. 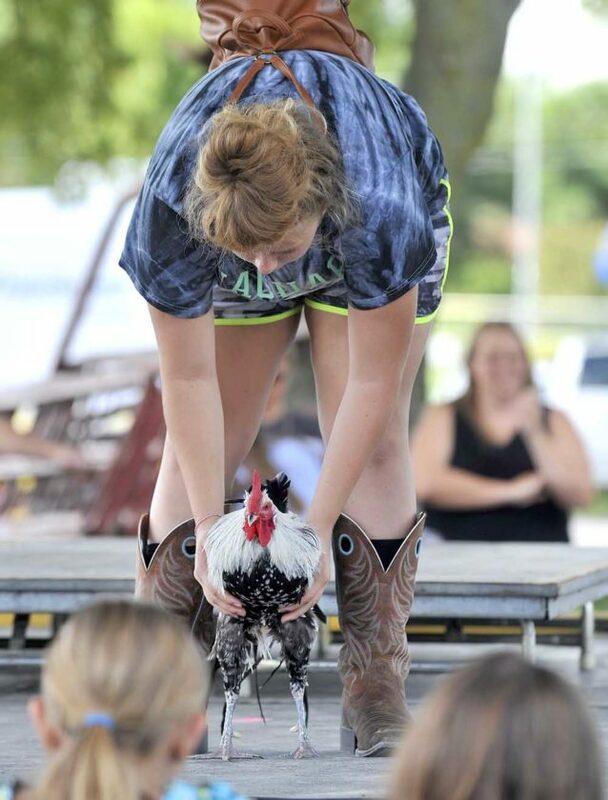 -Messenger photo by Hans Madsen Carly Davis, 14, of Lehigh, a member of the Dayton Tigers 4-H Club, tries to get Charlie to repeat his winning crowing performance Sunday morning during the Rooster Crowing Contest at the Webster County Fair. So how do you get a rooster to crow on cue when a crow is called for on stage. Apparently, according to Webster County Fair Board member Wendy Mills, of Harcourt — who organized a new Rooster Crowing Contest for this year’s fair — you don’t. “It’s just the luck of the draw,” she said. For the 4-H members who participated Sunday, having more than one rooster available might give them an edge. The contest was held at 10 a.m. which, by rooster standards, might actually be rather late in the crowing day. By tradition, they crow with the rising sun. That was, of course, not appreciated. “It really wasn’t,” she said. The contest got under way with a final announcement. “Calling all roosters,” she said. That was answered from the audience. Not to be outdone, one of the roosters answered that with a loud crow that could possibly have won the contest had it officially, been under way. 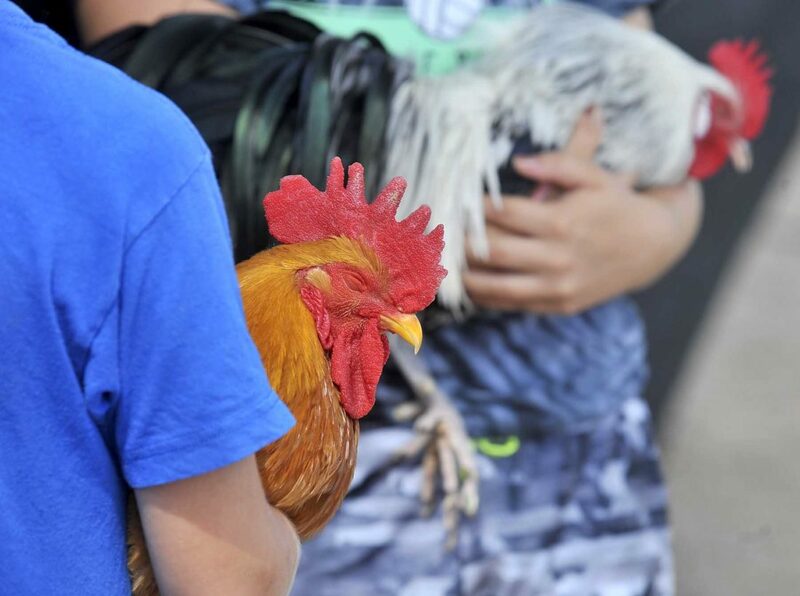 Morgan Christensen, 9, a Clover Bud, had to make do with a borrowed rooster named Jeffrey. He appeared more interested in taking a nap than crowing on stage. Once the contest got under way, Jeffrey didn’t really redeem himself. Opting to not crow much at all. The eventual winner was a rooster named Charlie, voice coached by Carly Davis, 14, of Lehigh, a member of the Dayton Tigers 4-H Club. While his crowing won the day, his attitude could have done with some adjusting. “He wanted to go fight the other guys,” Davis said. It wasn’t just actual roosters that got to participate, once the birds had their moment of fame, it was the human’s turn. Several participants, and their roosters, watched from the edge of the stage. The roosters remained mute on who the best rooster caller was. Perhaps roosters are not the best judges of crowing contests. 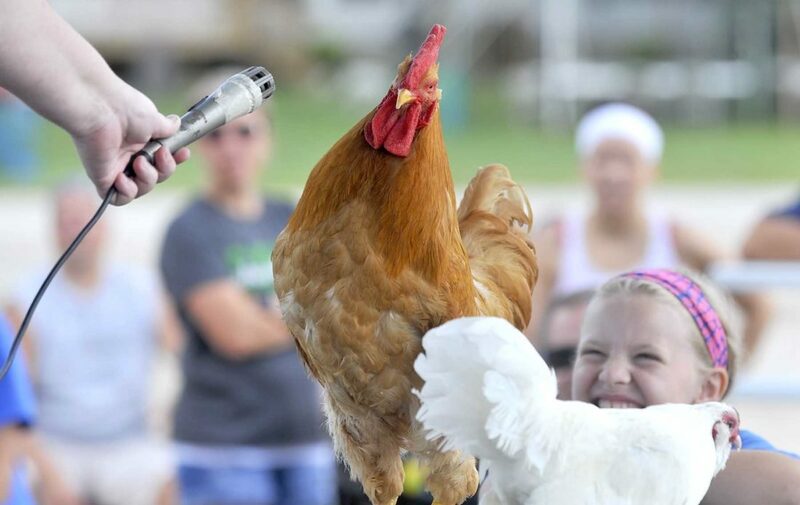 Instead it was decided by humans in the audience after a three-person call-off that left Curt Davis, of Lehigh, this year’s champion rooster caller. Davis said he prepared for the contest by a little bit of rehearsal. “I did a little bit this morning,” he said. The contest was also conducted with the safety of both the birds and those in the audience in mind. Should there have been any “incidents,” Mills was ready with a fishing net. “We have our safety equipment in place,” she said. It may not have been easy to access during the contest, however. Two of the entrants perched on it. The winners received gift certificates, and Mills assured everyone that the losing roosters would not be part of the afternoon’s wing eating contest.